Sharon and I have made it a tradition to host a fall dinner party [2014, 2013, 2012, 2011, 2010, 2009, 2008, 2007, 2006, 2005, 2004, 2003]. This year, the group included the Gainsleys, Sanborns, Larkins, Renterias, Janie and Liz. 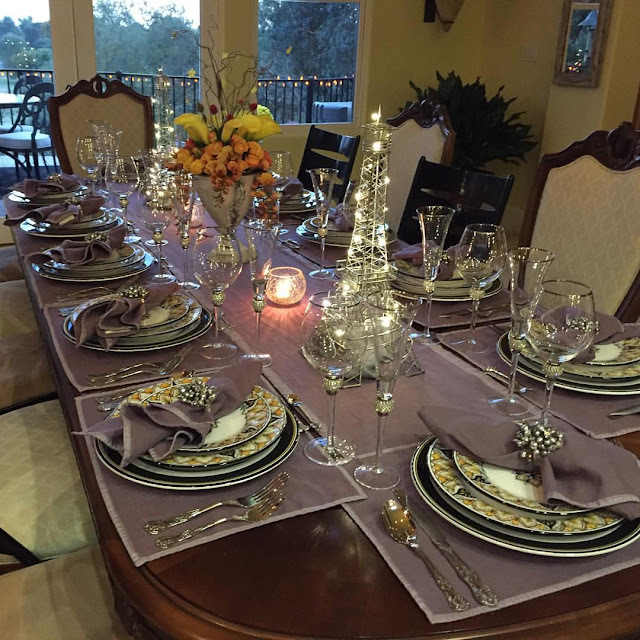 The theme of this year's dinner revolved around Sharon and Janie's trip to Europe. During dessert, we asked everyone to guess the number of pumpkins in the house. The guesses ranged from Phil's at 121 to Rod's at 285! It has become a tradition to finish the night with Dinner for One and the three Saturday Night Live Lonely Island videos with Justin Timberlake. For the first time, we had the party after daylight savings time and, as a result, started the party at 5:30 pm. It was 11:30 pm when Sharon and I walked the Larkins and Gainsleys to the front gate to catch a cab. Next year, the fall dinner party will be held at Sea Ranch. Sharon and I will be celebrating our twentieth wedding anniversary!